The ATG Learning Academy recently held a Dedication Ceremony to honor everyone involved in the rehabilitation of the school’s new facility. Included in the list of guest speakers was the Executive Director of the Bucks County Industrial Development Authority, Pete Krauss. Each speaker talked about their role in ATG’s mission and their expectations for the future. Following the speeches, several key individuals stood in front of the building to join the Founder and Head of School, Kathleen Smookler, as she ceremoniously cut the ribbon. ATG originally started as an evening tutoring center back in 2002. However, the students’ needs eventually outweighed the tutoring center capabilities and they became a licensed private school in 2005. Today, ATG operates as a private learning academy serving grades 1-12. They specialize in students with language-based learning disabilities, including but not limited to ADHD, dyslexia, dysgraphia, and central auditory processing. Their customizable teaching methods are tailored to each student’s needs through their broad selection of programs and methods of instruction. In 2017, ATG Learning Academy requested assistance from the BCIDA when they had to vacate their previous building after it was sold by their landlord. 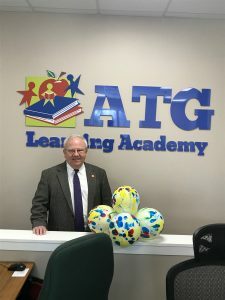 Ms. Smookler found a new location to operate and teach the 50 students enrolled at ATG, however, the facility owned by Warrington Township, required heavy renovations in order to meet the needs of the school. The BCIDA was able to provide assistance to ATG to make the necessary accommodations to operate at their new location on Pickertown Road in Chalfont, Pennsylvania. The BCIDA is optimistic that the ATG Learning Academy will continue to grow and expand through the years. The new building will have a tremendous impact on the development of the school. The BCIDA’s contributions assisted ATG in continuing with their mission to educate their students and improve the community.